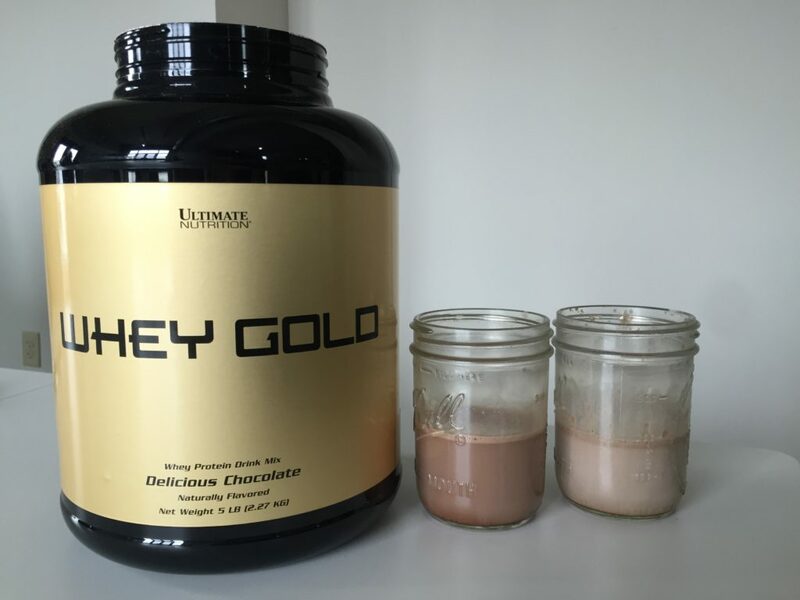 Home » Ultimate Nutrition Whey Gold Review — Is It An “Anytime” Protein Powder? 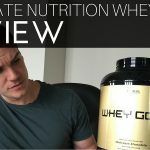 Ultimate Nutrition Whey Gold Review — Is It An “Anytime” Protein Powder? Ultimate Nutrition is a Connecticut-based supplement company that carries a lot of products catered toward bodybuilders. (The company currently sponsors six-time Mr. Olympia winner Phil Heath.) The company isn’t as ubiquitous in supplement stores as competitors Optimum Nutrition and Isopure, but Ultimate Nutrition has built a loyal following and has well over a million Facebook likes. 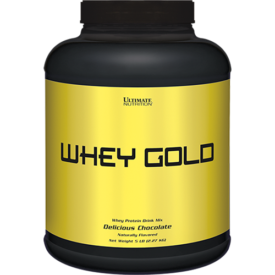 They produce several kinds of protein powder, and we decided to try out Whey Gold, their stab at an all purpose protein. Spiked with waxy maize for fast carb repletion, this whey blend is a favorite of bodybuilders and athletes. Let’s take a look at the nutrition label. One scoop contains 140 calories, 20 grams of protein, 9 grams of carbohydrates (no fiber), and 2 grams of fat, 1.5 grams of which is saturated fat. 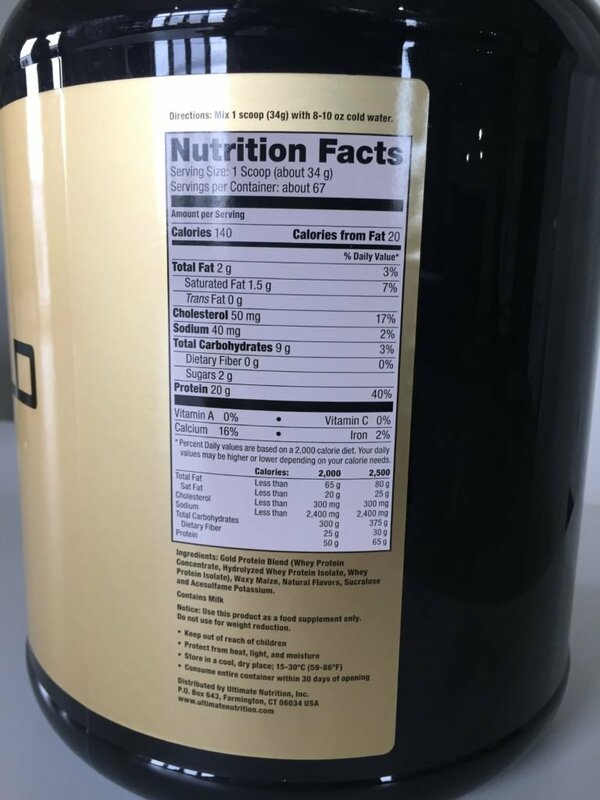 Despite the product’s passing resemblance to Optimum Nutrition’s Gold Standard, this is not a low carbohydrate protein powder. It’s also very low in sodium compared to some other protein powders (40mg per scoop) and it provides 16 percent of your daily calcium and 2 percent of your daily iron. The main ingredient is a blend of whey protein concentrate, hydrolyzed isolate, and isolate. Each of these forms have their own benefits: concentrate has more ingredients linked to health benefits (like CLA), isolate has the most protein, and hydrolyzed is absorbed the fastest. The second ingredient is waxy maize, a type of corn that is intended to spike your blood sugar when consumed post workout. The argument is that because your carbohydrate stores are depleted during a workout, you should spike your insulin by eating high glycemic carbs (like waxy maize) post-workout. This is mostly practiced by bodybuilders, and its inclusion shows that they’re targeting the bodybuilding demographic. Next the label mentions “natural flavors,” (we would have liked more information here) and then the artificial sweeteners sucralose (or Splenda), and acesulfame potassium. Whether or not the artificial sweeteners are a cause for concern depends on the person consuming the product, but I liked the fact that the product includes their names — some of their competitors just say “natural and artificial sweeteners” without any extra info. Here’s what I liked about this product: it blends three kinds of whey protein, it’s free of soy, it’s very low in sodium, and despite the imprecise inclusion of “natural flavors,” it’s ingredients label is more descriptive than some competitors. The artificial sweeteners sucralose and acesulfame potassium may be dealbreakers for some readers, and it’s also worth noting that there aren’t any additional digestive enzymes like lactase to help digest the powder, so it may be hard to stomach for the some 25 percent of Americans who are lactose intolerant (this percentage rises to 75 percent worldwide). The fact that there are nine grams of carbs for every twenty grams of protein is interesting. The pro is that the carbs, most if not all of which come from waxy maize, should help to spike blood sugar and send protein to the muscles more quickly before, during, and/or after a workout. The con is that this deliberate spiking of insulin means Whey Gold is not a great “anytime” protein shake. So the protein quality is high, but the waxy maize and carb content may make it less useful for the average reader. This product appears to only come in five-pound tubs that cost 90 dollars each and provide 67 servings. That means it costs $1.34 per serving or, if you want to get very granular, 6.72 cents per gram of protein. That’s quite pricy from a cents-per-gram-of-protein standpoint; you can compare that to Dymatize Elite (6.24 cents per gram of protein, 5-pound tub), Jym (4.49 cents per gram, 4-pound tub), BPI Sports Whey-HD (3.6 cents per gram, 5-pound tub) and Optimum Nutrition’s Gold Standard (3.31 cents per gram of protein, 5-pound tub). But since this isn’t a low-carb protein powder (or a high-carb protein powder, it’s somewhere in the middle), it’s probably best to look at the price per serving. From that standpoint, this is still relatively expensive at $1.34 per serving, though by a smaller margin. Compare that with Jym ($1.25 per serving), BPI Sports Whey-HD ($1.09 per serving) , Cellucor Cor-Performance (93 cents per serving) and Optimum Nutrition (79 cents per serving). For a product without lecithin and with no artificial ingredients for this purpose, it mixes surprisingly well. It doesn’t take much shaking for it to mix, though it doesn’t dissolve as well as, say, Optimum Nutrition — there remains some very small clumps or powder, but it’s still very easy to drink and doesn’t irritate the throat. I tried “Delicious Chocolate” flavor and it tasted great — very creamy and closer to milk chocolate than dark chocolate, which meant that it was surprisingly palatable with water but a little too creamy tasting with whole milk. 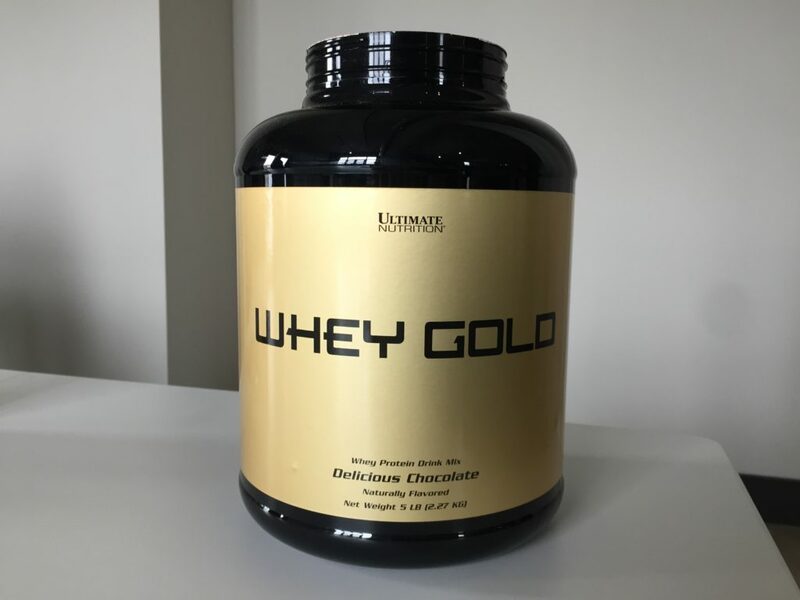 If you’re drinking it with low fat milk, however, I think Whey Gold would be a great way to restore the creamy flavor that’s lost with the fat. Overall, this is a fine product that could be a good choice for bodybuilders who want to spike their insulin and who want to minimize soy, but as a supplement for the general population it’s not at the top of our list: it’s pricy, it’s not a great “anytime” shake, and it might be tough to digest for folks with sensitive stomachs.